I find myself lying on the floor next to a bed. Where am I? I tried to look out of the window only to be blinded by the light outside. The state of giddiness I'm experiencing now means I was sleeping heavily earlier. Oh yes, I'm in my bedroom. Yesterday was so bizarre that it seemed like a dream. I headed to the kitchen only to find that I am low on food, bottled drinks and many cleaning solutions. Current supplies would only last me until the end of the week. I noticed that I was running low on stationery and the summer holidays would end soon. Though I'm somewhat reluctant to do this by myself, I have no choice but to head to the supermarket downtown as the stores near at the train station near my house where my workplace is has limited variety. Looks like I have to get ready to go out. As I left my apartment complex, I tried to look for my mobile phone and my bicycle that is usually parked at the usual place, but they aren't there. Thinking hard, it felt like I am playing the violin right now somewhere. Oh yeah, I forgot. I went to my school in my other body for the festival practice this morning with my bike and parked it at the train station. The reason why I used that is that I was very sleepy back then and those escaped prisoners who are most likely to be after me. I do have the wheelchair from when it was unable to move (back when my mind was separated during which I was accidentally cloned), which I can move around at will, but not only would that be silly to use, it is slower than a bicycle and would unnecessary make my mind tired. Looks like I have to walk then. The train ride was almost an hour long. 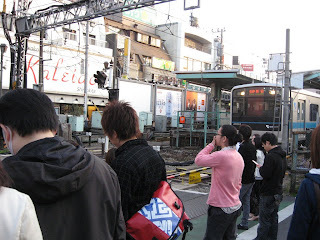 During which, the train gets more crowded as it got closer to the downtown area. Due to the location of the station I alighted at, I have to wait for that train to pass before I can cross over to the other side. The station looks quite old, so the air today is better when it was opened as trains back then produced dark smoke and were quite loud. There is however, the problem of people smoking cigarettes (males especially) around me. What exactly should I buy? I didn't prepare a shopping list and I can't carry all the things I need home by myself. My friends are busy with their own things. That was when my other self was done with music practice and summoned her to come with me so that at least I have extra hands to help me when I'm done. I know I want to drop by my former school from there, but that can wait and the sun is already starting to set. Strangely enough, the foreign country I went to recently has the fastest sunrise and sunset and that familiar orange sky lasting for several hours is replaced by the blue sky getting darker and vice versa in an hour. Maybe it has something to do with the geographical location as it is near the equator. Hey, I know this is my account, but I don't remember having so much money as to be able to buy several of the most expensive things in full payment that I can think of. Am I that rich? Is there an error? Did someone transfer them to my account? I don't know, but I am shocked about it. The other me appeared next to me with my violin case on her back and my work passes (both the old and new) hung around the front just as I was about to head to the counter. I know it's her and not some imposer as I can see myself from her point of view and control her movements. She also wears a friendly smile on her face at me. The queue at the available counters is long due to the crowd as people are starting to head home from work at this time. I feel awkward being stuffed with countless number of stuff. It's like stuffing food into the Turkey during Thanksgiving in the west, but shopping bags into my bottom? I know how useful this is by reducing the load I carry with my hands or on my back, but this method is so unbelievable! In fact, I can even stuff myself in there if I want to. Now we are left practically nothing to carry! As we made our way to the station, I suddenly remembered that I had left my money back at the cashier. I decided to head back to the supermarket while the other me would walk towards the station and wait for me there. 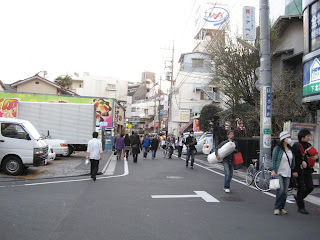 While walking to the station, I saw many people asking someone in my direction to run away quickly in a worried manner like something serious is going to happen. I don't know what was going on, so I just turned around to see. I was then pinned to the ground as they stab me with the knife repeatedly, with blood spurting out from the wound and my mouth. I wasn't saying anything, but I can hear myself shouting in pain each time they stabbed me. Onlookers are keeping their distance from them for fear that they might attack them. Tanigawa-kun from my old high school was one of them. The strange part about this is that I feel perfectly fine, as though nothing is happening, but my body is reacting as though I am actually being killed. So, is this body pretending to be dying in front of these killers to deceive them, or am I actually being killed? Because that colleague of mine at that hospital said that this body (the cloned one) is supposed to be invincible. Ether way, I still have the me who went back to the market earlier to live on, but would raise odd questions if the media or police were to be involved. After stabbing me countless number number of times, they ran away with the knife with an evil smile on their faces and shouted excitedly with each other. As a warning to the onlookers to stay away from them as they escaped, they pointed the knife that was stained with my blood as they start to get away. I wonder what I look like, the same as the hit-and-run from earlier? What I do know is that my eyes and mouth are wide open, my head is tilted to one side and I can't move my body at all like I am a dead person (again). Someone is holding my hand against their face and crying on it. Eww, gross! But that is nothing compared to my stab wounds, if I can see it. At that time, I sense that the other me is nearby. Help me, I'm not as dead as I look! There seems to be some kind of commotion on my way to the station. I know what happened, but I just need to be sure. As I got closer, people were looking at me like they had seen a ghost. Well, apart from the different set of clothes, I do look exactly like the one who was stabbed. Upon reaching the scene, I saw those prison escapees, that I knew too well of, running away into the distance. At that moment, I saw Kenjiro (a classmate at my former school) crying, holding the hand of my other body, saying something about only being met this morning and that "she has left the world". My senses tells me that the body he's holding is in a pretending-to-be-killed mode and is in fact asking me for help, so it's alright. That body can be restored back to it's normal state, as though the stabbing never happened, but that can happen when I am the only one around or when no one is looking for a period of time. I went to have a closer look and saw something horrible that could have happened to me. 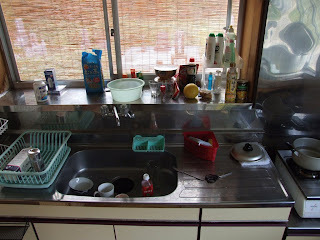 I went to Kenjiro and say that I would take care of things from here and brought her to a quiet corner. It really does look like a corpse. Kenjiro was shocked when he saw me. When we enter a quiet corner, something magical seem to have happened as all the wounds and blood disappear, and the clothes appeared to be repaired by themselves. We then made our way back home, but to reach the train station, we have to walk through the incident site again. 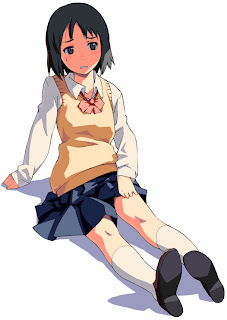 More people were shocked as they see her perfectly fine like it never happened, though Tanigawa-kun appears to have left. The blood stains at the site are still there.